Pride of the Port. The name evokes images of sailing ships, moored at wharves, being loaded with cargo - maybe chests and casks of tea! The pride, perhaps a ship above all others, emblazoned with fresh paint, sits ready to sail. Peet's Pride of the Port brings together black teas from both India and China in honor of a certain tea merchant, related to Peet's tea buyer, and his ship. The aromas that waft from the tin upon removing the lid are strong, grassy scents. Heavily malty, slightly smokey, and smooth. 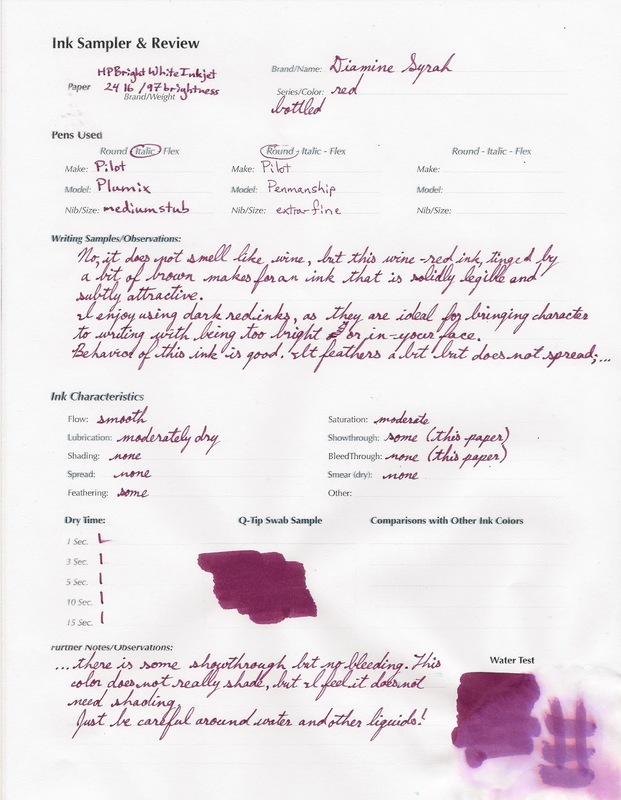 In some ways, it is reminiscent of a port wine in that the smoothness complements the intensity of other aromas (and flavors, as I know from having sipped this tea before). 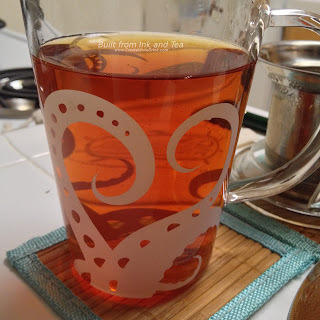 Four minutes, twelve ounces of just-boiled water, and a teaspoon and a half of Pride of the Port combine together in the alchemy that is steeping tea to produce a reddish cup. The leaves themselves look beautiful, brown, white, and yellow mixed together. 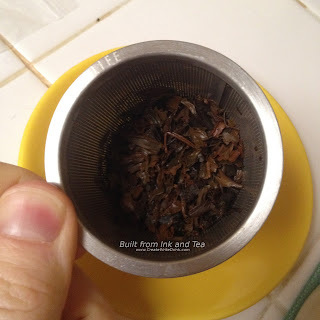 Peet's had recommended four to five minutes, but from the smell of the cup I am glad I did not steep it longer. To me, just from the aroma, it seems rather strong, the maltiness quite heavy! 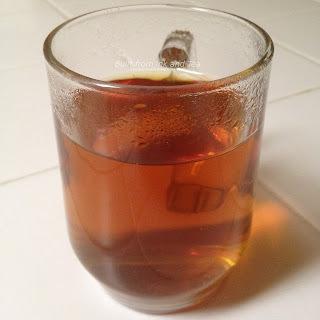 The flavors - such a smooth bodied tea! The maltiness adds a touch of astringency to the finish, but the body tastes so smooth. It is definitely strong. The body also has a fullness of flavor, grassy aspects and "bright" tones, which intrigues the taste buds and pleases the palate. Four minutes seems to have been a rather ideal steep time after all. I found that the smell of the brewed tea aligned more closely with the finish of the cup than the body itself. 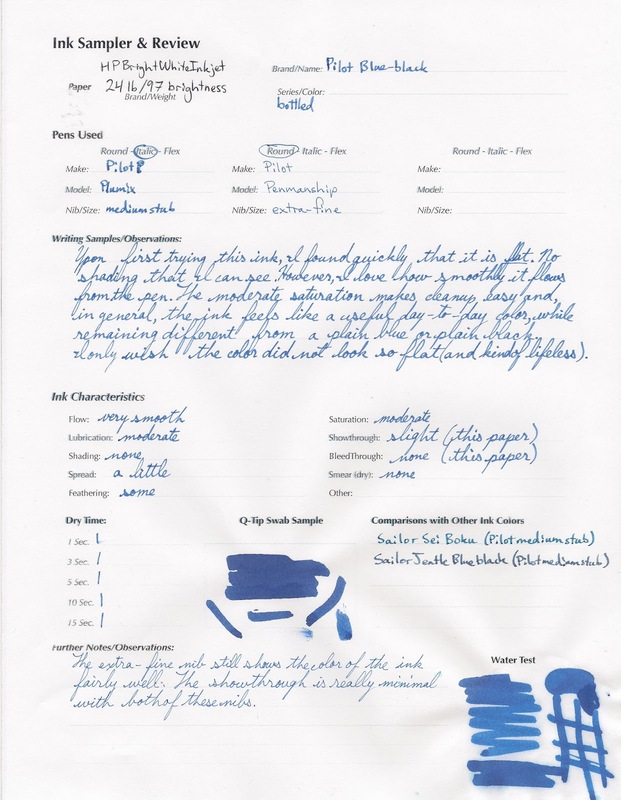 On my personal enjoyment scale, I would rate Pride of the Port a 92/100. As with all Peet's teas, these have now been rebranded as Mighty Leaf-brand teas, following the acquisition of Mighty Leaf by Peet's Coffee & Tea. 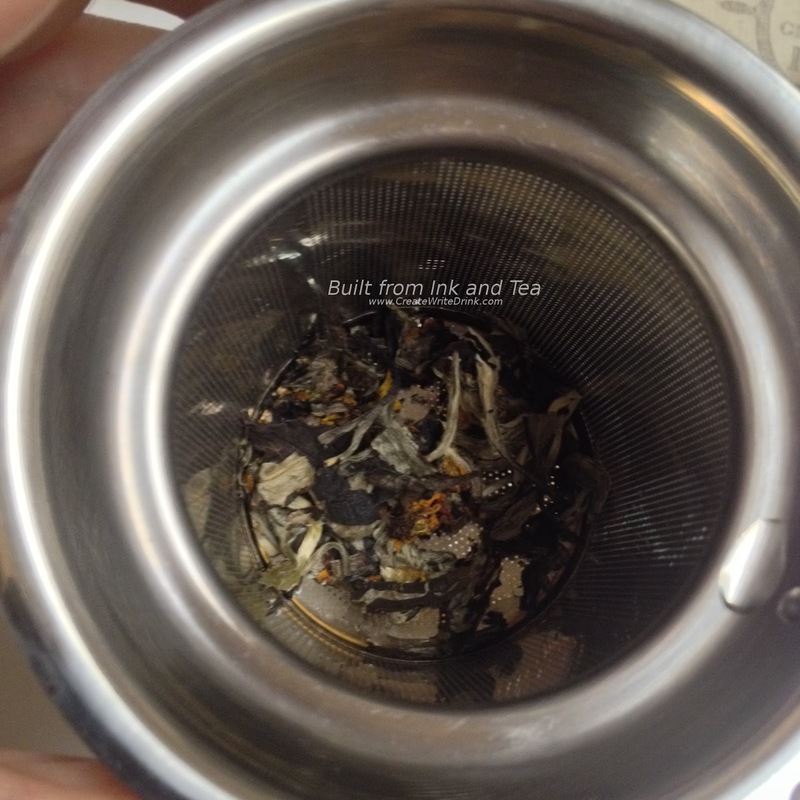 The tea inside the container is still the same. That said, you should be able to find them in your local Peet's or online. Peet's Coffee & Tea Pride of the Port is available from their website, here. There comes a point in the crafting of a new tea blend, where inspiration (based upon some existing blend) meets the creativity of an original idea, and from this is born something magical. That something will be just far enough from the existing that it could not be termed a variation, while still holding a good amount of influence thereof. Evergreen Spice draws inspiration from the traditional Indian masala chai, yet it deviates to become its own magic. The base contains chai spices, much as one would find in an Indian chai. Yet, black tea has been replaced by an Anxi oolong from China. Mixed into this blend are roasted cedar leaves with a touch of spearmint and tulsi, an herb native to India and often consumed in teas and tisanes. 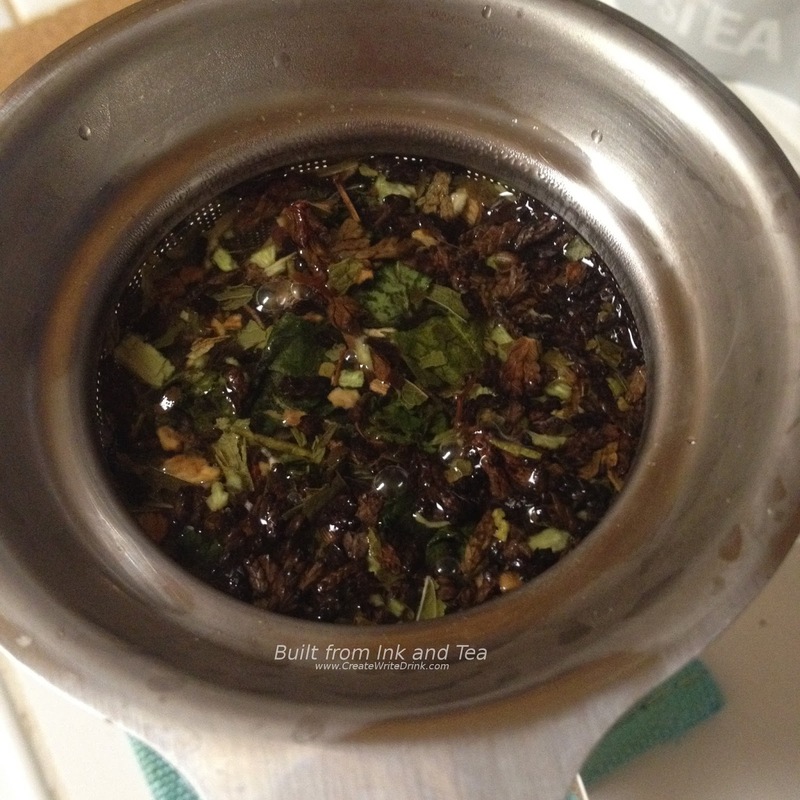 I steeped two teaspoons of Evergreen Spice in twelve ounces of water, just under a boil, for three minutes. 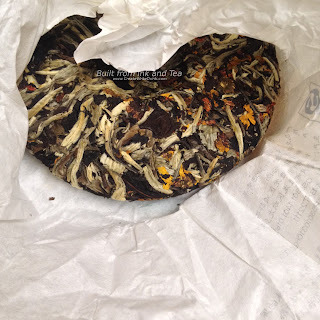 While the tea brewed, I breathed from the package of dry leaves and ingredients. Every smell was so distinctive. Immediately noticeable were the cedar leaves, the tulsi (once you have smelled it by itself, it is very easy to identify), the spearmint (to a small degree), and the sweet-spicy mixture of chai spices. It roars over the senses in a cool rush, a spicy cool rush. The aroma that wafts from my mug surprises me with how different it seems from the dry tea blend. The smells are much darker and warmer. 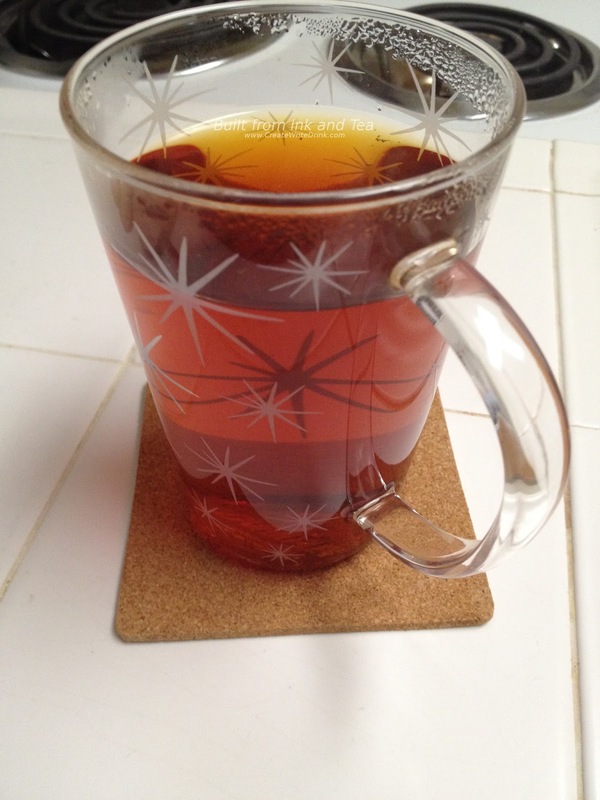 Still prominent is the cedar, yet ginger and cinnamon notes, subtly sweet, join in the aroma, along with...the tea! The notes of oolong are a bit floral, a bit mineral, and a touch creamy. 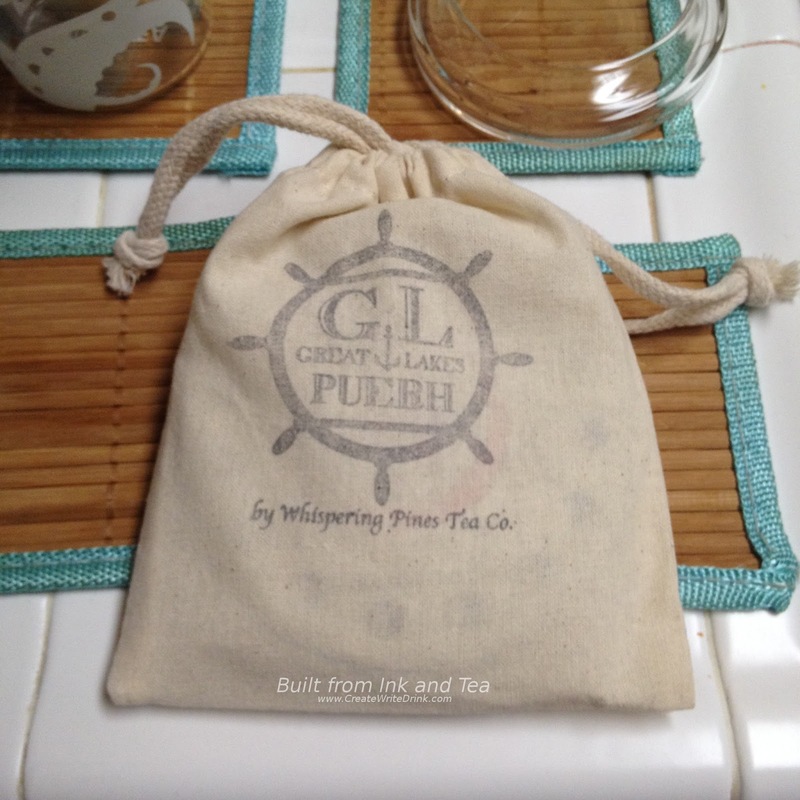 Aromatically, this tea has been a transporting experience, and it has not yet even touched my lips. The first sip...blends together my aromatic experiences. Cedar and tulsi hit the tongue first, backed by the warm chai spices. It tastes like the undercurrent is the oolong itself, carrying the rest of the ingredients along. The spearmint does not taste very prominent and really sits in the background and aftertaste, lending some sharp sweetness. Individual flavors seem to be harder to differentiate in the taste of the tea than they were, when I was smelling it. The whole experience feels good. From the first smell of the dry tea blend to the last sip from my mug, the sensory input soothed and warmed and uplifted. Sitting in my living room, I feel as though this is the ideal spot for it...yet I can imagine sipping from a cup of Evergreen Spice, while trudging through packed snow in winter. On my personal enjoyment scale, I would rate Evergreen Spice a 95/100. If you ever wondered, whether making a standard Russian Caravan black tea blend stronger was possible - I can safely say, now, that it is. 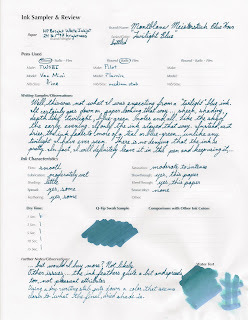 Carävan is unlike any Russian Caravan blend I have ever tried before, and now we have the review so that you can learn about it! Russian Caravan has traditionally been a blend of oolong, keemun (a Chinese black tea), and lapsang souchong (a Chinese black tea smoke-dried, which carries much of that smoke flavor within its leaves). While the addition of teas other than lapsang souchong to the Russian Caravan blend tend to mellow it, as the smokiness decreases, Andrews & Dunham have taken it to another level. In the smell of the leaves alone, it seems to me that Carävan has more smokiness and more robust aroma than the standard Russian Caravan. Andrews & Dunham recommend steeping a teaspoon of this tea for four minutes in eight ounces of just-boiled water. I doubled that, using two teaspoons in a two-cup teapot. Boom! The aromas coming from the teapot prop-open my tired eyes by themselves. The standard Russian Caravan smell seems to be intensified with something sharper, something more malty, something I would say was "harsher," if that did not sound so negative. Sip number one and the tea roars over my tastebuds. The smokiness is not as intense in the body, unlike what I had anticipated. It does, however, fill the mouth and linger in the aftertaste. The body tastes primarily like a surprisingly-smooth black tea; that maltiness I mentioned earlier really only settles on the back of the tongue. Initially, I felt that it would be strange to term this tea "dynamic," but it does seem as though the tea brings good complexity and character to the cup. As far as Russian Caravan blends go, this one tasted great! 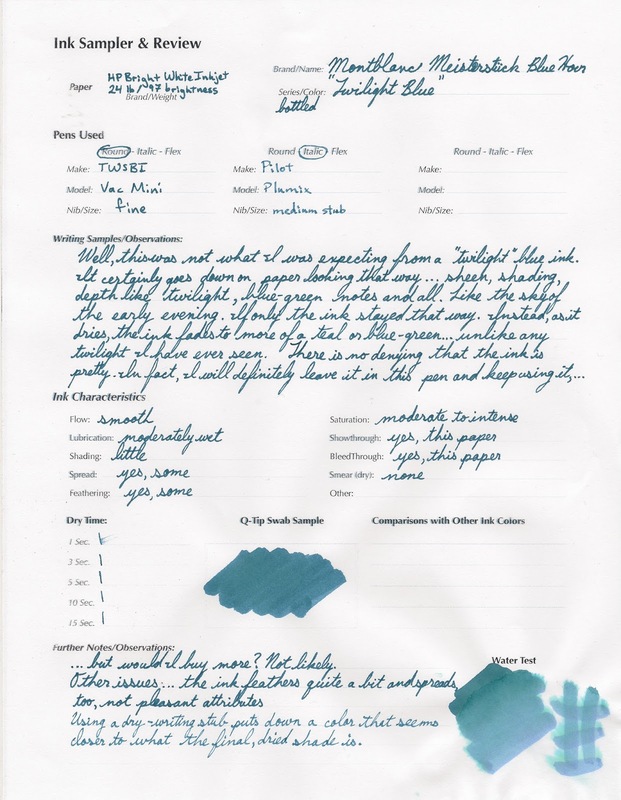 It is certainly one of the best I have ever had. On my personal enjoyment scale, I would rate Carävan a 94/100. 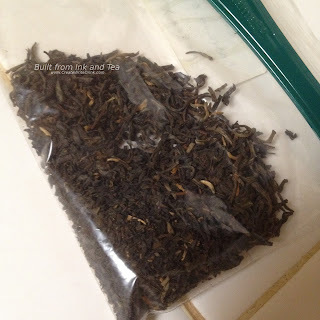 If you like your black teas with smokiness, then Carävan is for you. It is worth noting that Carävan was removed from the Andrews & Dunham lineup for a time, but it is once again available, rebranded as Carävan Resurrected. My understanding is that the underlying tea blend is the same. 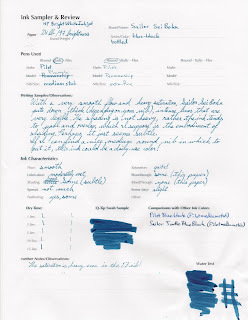 Andrews & Dunham Damn Fine Tea "Carävan Resurrected" is available from their website, here. 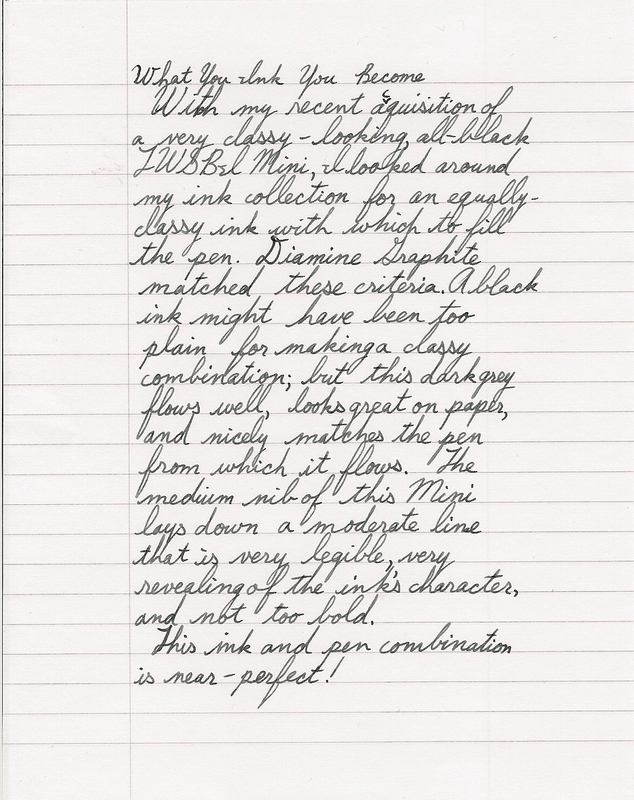 This ink and pen combination is near-perfect!" 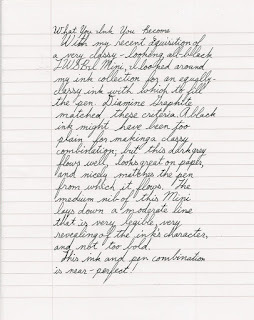 My review of Diamine Graphite ink can be found here. When steeping cakes, as with life, remember that there will always be more (tea) there than it seems. 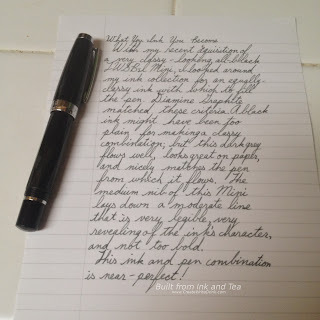 Okay, so my book of teaisms could use some work, but this was in fact the first mis-step I took with Whispering Pines Tea's 2015 Moonlight Sonata. 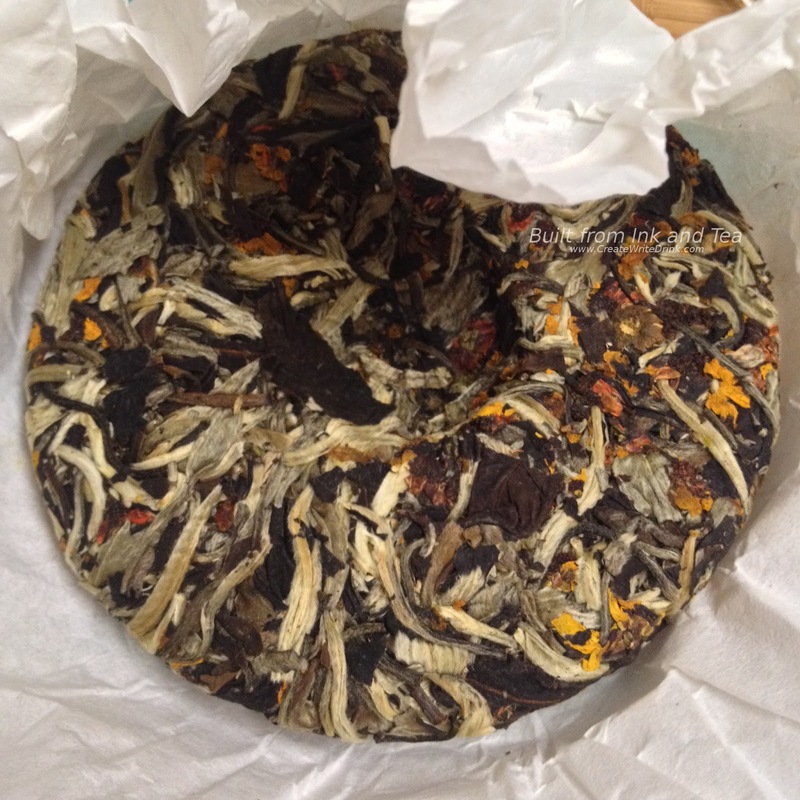 Given that this white tea comes in a cake, much like pu'erh, I neglected to account for the fact that it was so tightly packed. Therefore, the amount of tea I thought I was using for my western-style brewing (a tablespoon and a half) was in fact three tablespoons by the time it unpacked and expanded. For those who would brew this tea by gong fu, using a gaiwain or a yixing pot, the abundance of leaf is merely a factor with which to work. 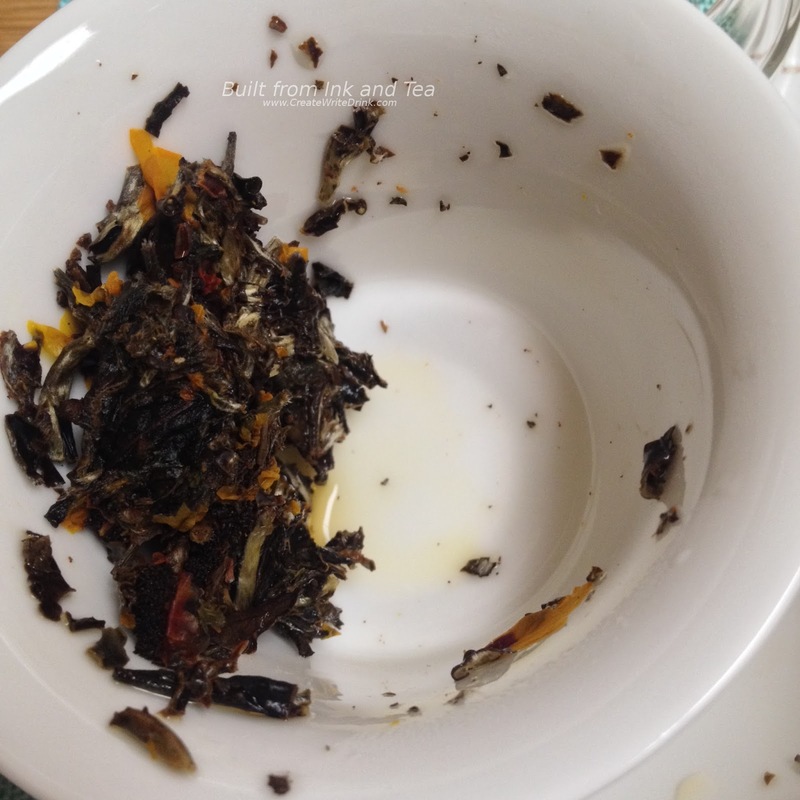 As you can see from the photos, I did not pack the gaiwan very full, but these leaves expanded quite a bit. I must now go back and comment on the wrapper. 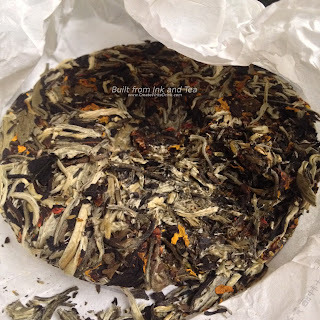 I really enjoy Whispering Pines Tea's 100g cakes, which up until now were just of pu'erh. The artwork for each is gorgeous and striking. 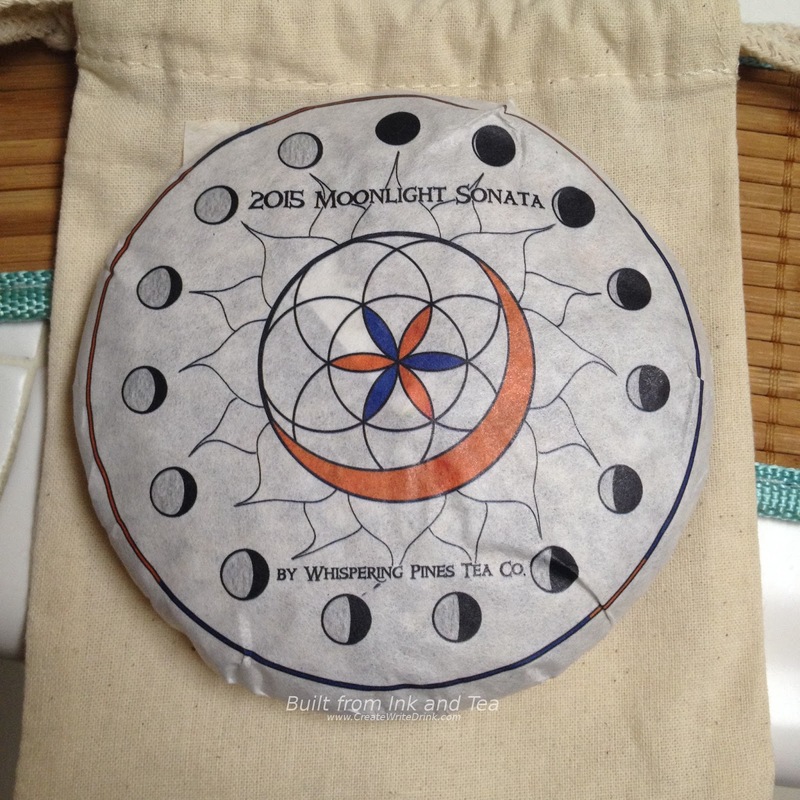 The Moonlight Sonata is no exception, with its moonphases, flower petals, and mesmerizing pattern. 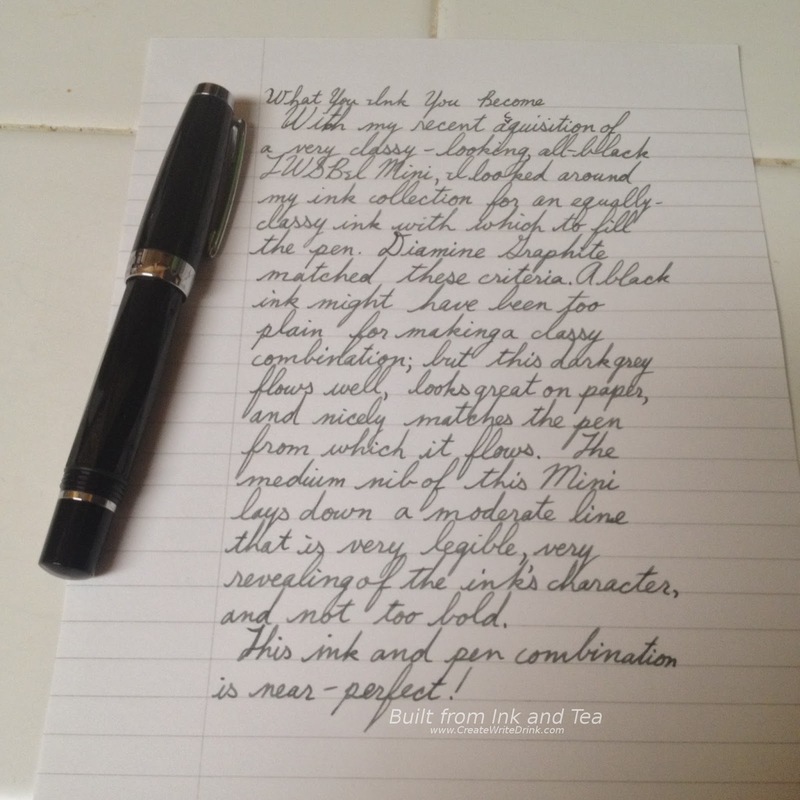 This, along with the tea, shows the expression of creativity that Brenden of Whispering Pines pours into his craft. 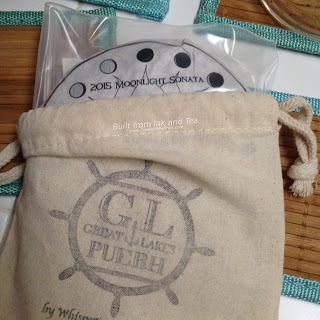 The bag in which Whispering Pines' cakes now come packaged will provide a great, breathable place in which to age their cakes. Based on previous teas I have gotten from them, this must be a new idea, and I think it works wonderfully. Then, on top of that, to package the wrapped cake in a plastic bag for transport (seemingly with the intention of keeping out as many impurities as possible that might otherwise find their way to the tea, while it is in transit to you) seems fairly genius to me. As to the tea itself, I am going to come clean up front. The second ingredient in this cake is snow chrysanthemum flowers. Having had these brewed into a tisane for me many times in the past, I can say with certainty that I am not a fan of their flavor. Yet, my first breath of the dry cake, when I unwrapped it, contains a pleasant meld of the two (white tea and snow chrysanthemum). It smells a bit earthy, and the aromas hint at deep notes of the ingredients - to be released by heated water. Eagerly, I poured water over both the leaves in an infuser mug and the leaves I had placed in the gaiwan. The mug I left for three minutes, and the gaiwan for only twenty seconds. The tea, both in its dried and wet form, appears very pretty. 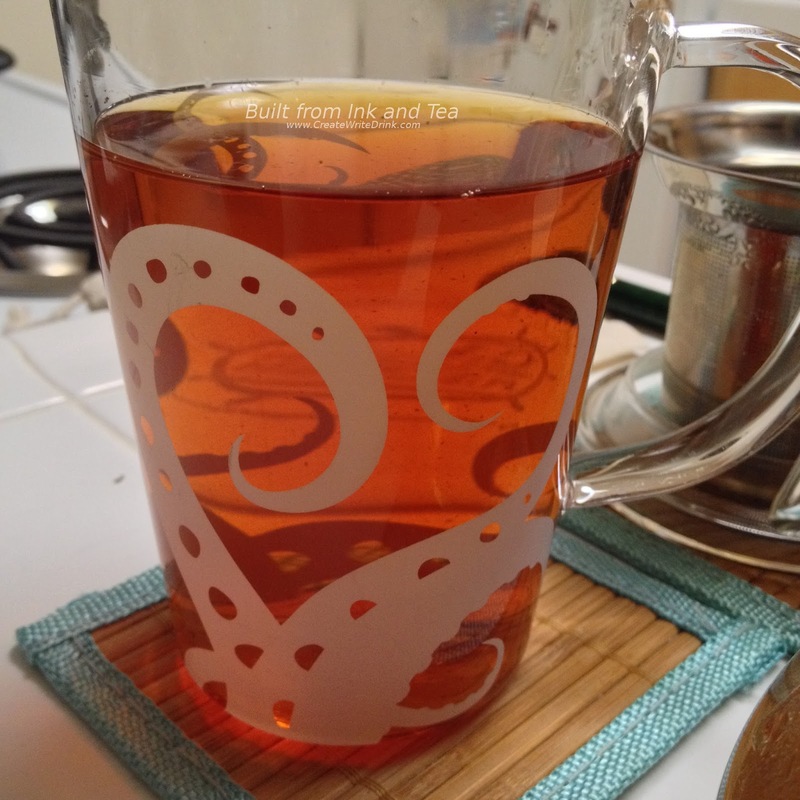 Given the color of the liquor, when both teas finished steeping, I think I may have overdone both. So I pour the gaiwan-brewed tea into cups, smell mine, and accidentally knock over the cup on the table before me. Cleaning-up the sadly wasted tea, I am reminded that tea is an experience and something to be taken slowly. I return to the aroma of the cup, resplendent with snow chrysanthemum. Hints of white tea peek through the smell. Yet, it is when I take a sip that my senses are awakened. 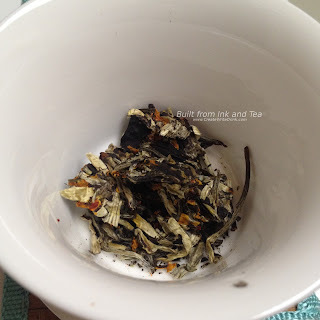 Snow chrysanthemum and white tea seem to fight a twisting battle over my tongue. Or perhaps it is my tongue that is being tricked, as both of the flavors actually meld very well together. In one moment, I taste a bit more snow chrysanthemum. In the next moment, the rich white tea flavors take over my tastebuds. The aftertaste leaves a hint of snow chrysanthemum in the mouth, a ghost of past flavors. At this point, I move to trying the steeped mug of Moonlight Sonata. The flowers give it an almost-juicy taste. It reminds me a bit of either citrus or stone fruit with dark, earthy notes. The cup goes down smooth, and I wonder to myself why I never cared for snow chrysanthemum in the past. I heat more water and begin to re-steep both the gaiwan leaves and the infuser mug leaves. 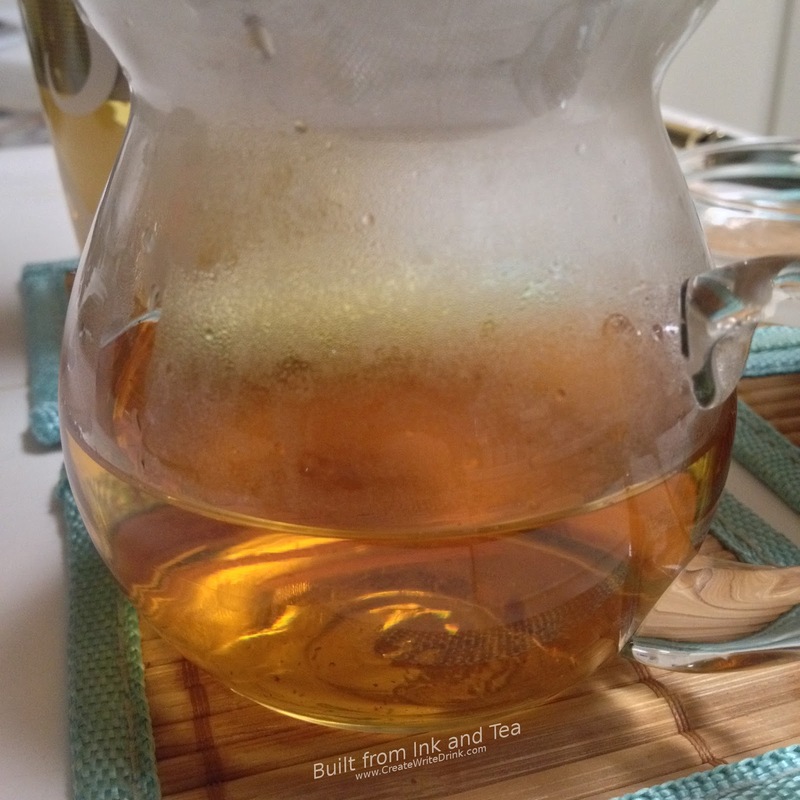 Over time, I find that the snow chrysanthemum handles the multiple re-steepings much better than the white tea. 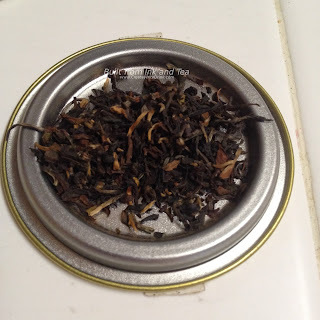 Its flavor grows richer, while the flavor of the white tea stays much the same. They remain well-balanced and well-blended, which in turn causes the overall flavors of the tea blend to evolve to a darker-tasting brew, still full of floral and fruit notes. Just breathing-in the aroma from the empty cup fills the nose with floral notes, accented by some earth and wood tones. The smells are like springtime, flowers having just bloomed from both ground and trees. The re-steeped tea in the infuser mug grows darker much faster, as we went from three minutes (first steep) to five minutes (second steep) to eight minutes (third steep). 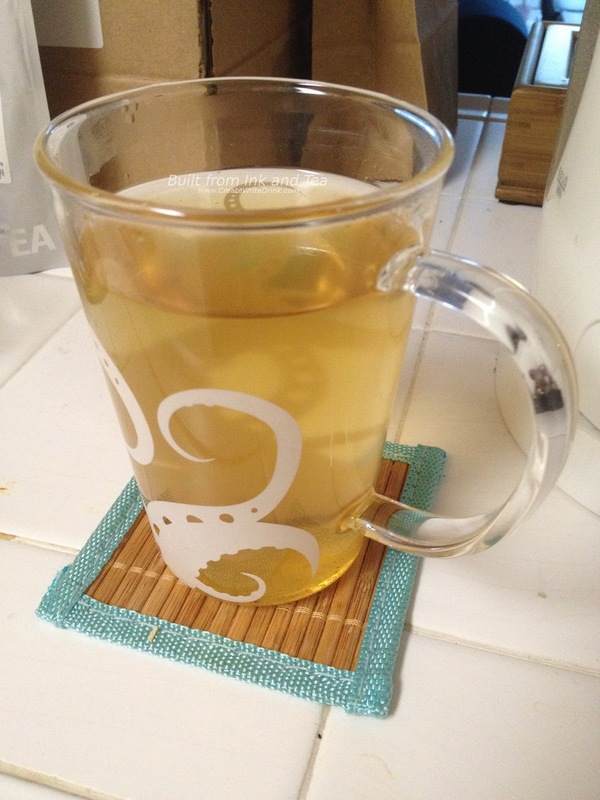 The white tea does remain a bit more prominent in that cup, though. 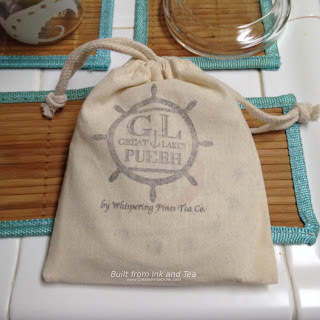 In general, I feel that I agree with the recommendation from Whispering Pines Tea - gong fu is my preferred brewing method for this tea. The evolution of the aromas and flavors feels much more like an experience when taken one gaiwan at a time. This limited release white tea sparked my senses, and the fact that it should be ageable intrigued me. 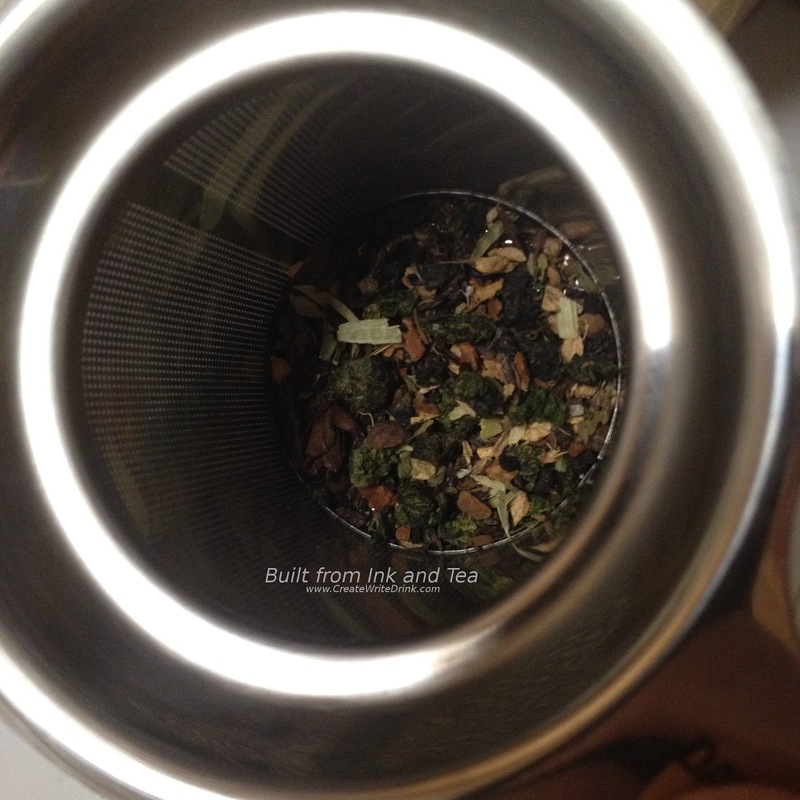 With only two ingredients, it created a multi-faceted experience unlike many teas I have consumed recently. On my personal enjoyment scale, I would rate Whispering Pines Tea's 2015 Moonlight Sonata a 96/100, and I highly recommend trying this tea blend. Whispering Pines Tea's 2015 Moonlight Sonata is available from their website, here.